Wales is bracing itself for strong winds across Sunday and Monday, with gusts of up to 80mph (129km/h) expected in coastal areas. The Met Office has issued a yellow weather warning for wind between 15:00 GMT on Sunday and 06:00 on Monday. 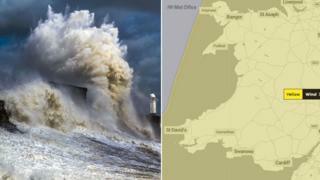 The warning covers the whole of Wales, with the Irish Sea coast set for the worst of the winds. The Met Office has said there will be "some travel disruption and possible dangerous conditions". Will extreme weather of 2018 be repeated? It added that Storm Freya could cause injuries and "danger to life" from flying debris, while damage was possible to buildings and trees. It comes less than a week after Wales basked in its warmest ever February day. Could Wales face a repeat of 2018's extreme weather?